Chores are daily responsibilities that a child is required to do on a regular basis, such as feeding the dog or setting the table. There are household tasks we expect of kids. We don’t think of them as chores but just as part of self-care, such as brushing teeth; Or respecting the needs of others, such as not leaving wet towels on the bathroom floor. Then there are times when a household task comes up and you want your child to help you then and there- such as helping you carry in the groceries. In all these cases We expect something of our child and they either are not cooperative, or are sullen about it, even if they are cooperative. Some parents say they are ready to give up on kids doing chores altogether, or asking for a child’s help because it is so unpleasant. 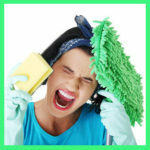 While I understand often it is easier to do a chore/task yourself, I encourage you not to give up. A Reflective Mindset can help A reflective mindset, can’t remove the conflict and unpleasantness altogether but it can help you feel better about them when they happen. First and foremost You are not alone! Lots of parents wish their child wanted to help out more around the house, and was cheerful about doing chores. Lots of parents get into conflict with kids about them helping out with work around the house. Lots’ of parents have to nag their child to do their chores. 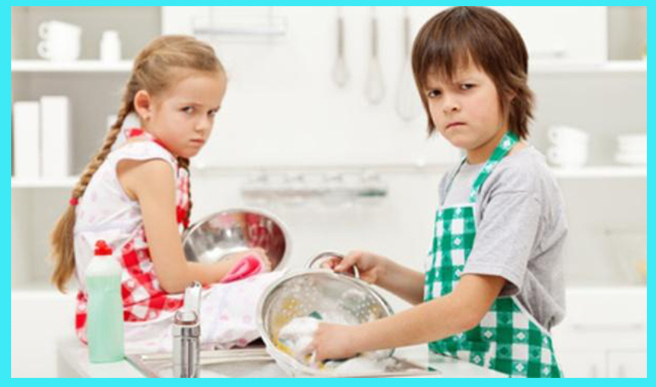 Lots of kids are grumpy and sullen when you ask them to help you or you remind them to do their chores. Lots of parents feel the whole effort of getting a child to help out with household tasks or to do their chores, is a big chore! If you go on the internet there are lots of suggestions for you to try. Make chores and helping out into a fun activity. Set a timer and see how quickly a child can pick up their toys. Make putting your clothes into the hamper like a ‘basketball game.’ Have a family meeting and come to an agreement about what chores and tasks the kids will do. Many of these suggestions work and some kids are cooperative. But not always! What you can do: Align your expectations with reality. I find that most parents typically have rather reasonable expectations of what their child should do around the house. Unfortunately, however, these same parents often have rather unrealistic expectations about how their children should feel about it. A child should be happy and cheerful about chores and delightfully willing to help. A child ought to show their appreciation for all the parent does for them, by wanting to give back and help their parents. This is when the 2-way perspective taking of Reflective Parenting is helpful Children often express their autonomy and independence by showing displeasure with what parents ask. Children do appreciate their parent’s efforts but too much emphasis on having to show appreciation can make a child feel guilty or burdened about the work their parents do for them. It is OK to ask kids to say ‘thank you’ when you do something special for them. But they should not have to show their thanks by doing something special back for you. A mismatch of expectations can make parents feel overly annoyed, hurt or helpless. It can even make them feel overly negative about their child. You may get more by expecting less. Don’t get me wrong. There are enormous benefits to kids doing chores and helping their parents. It teaches kids a long list of important values and lessons: Being cooperative; Helping others; Being considerate of others; Learning not everything in life is fun and easy; Being a responsible member of a group. But if you expect your child to immediately cooperate or to be cheerful about it, you may be expecting too much. They are called chores, tasks and work for a reason. If you are honest with yourself, you don’t like doing chores either. You may even feel grumpy when you have to do that work around the house- carrying groceries, doing laundry, picking up after yourself; or tasks like fixing a leaky faucet. It is not always a problem when your child is negative. Just because your child grumbles and whines does not mean there is something wrong either with your child or with your parenting. As I said earlier a child’s negativity is often their way of expressing their autonomy and independence. While it might be easier if your child were more willing, positive and cheerful about chores and helping-sometimes the lesson about being responsible and considerate is best learned when a child has a tussle with their parents and the parents keep insisting, despite the child’s protests. The more confident you feel in what you are expecting of your child, the more calm but firm you will be about it. Pick chores that are age appropriate, so you won’t be second guessing yourself as to whether your child is capable of fulfilling the chore. Be consistent but also flexible and open-minded. Be clear about your expectation but don’t be a stickler. Life happens. You often put chores and house work aside when other things take priority. This will happen for kids as well. Be realistic about what to expect. The point is for parents to acknowledge that while we can have a fair amount of control over how our children act, we don’t have control over how they feel. Persevere and keep at it. When parents stick with it, despite the child’s distress and lack of willingness to cooperate it is an amazing lesson and adds to a kid’s sense of security. It says to a child, “I have strong, confident parents I can count on.” It says, “My parents care enough about me to go through all this difficulty with me.” It says, “I am really a part of this family.” It even builds family pride- This is how we do it! WHAT IS REALISTIC TO EXPECT OF KIDS? You CAN expect and insist and require kids to do chores, and to help out with work around the house- as long as what you ask of them is age appropriate and within their capacity to do it. You CAN’T expect kids to feel the way you wish they would feel. We don’t have control over how others feel. Trying to control how your child feels often backfires because it makes kids feel intruded on, manipulated, controlled and resentful. Yes every parent would prefer a smile when a child does their chores. But don’t get hung up on always expecting that. It is just not always how it turns out. Balance holding the feelings with holding the line: So much of reflective parenting has to do with being tuned in and responsive to how kids feel. However, there are times, such as when it comes to kids not wanting to do chores, or help out, when you probably do best by not focusing so much on how your child feels about it. Focus on the behaviors and explain the expectations. Tell your child what you expect them to do. Explain your reasons for wanting this. Try to avoid insisting on how your child should feel it. Feelings follow from habits When we focus on the behavior, and are consistent and repetitive about what behavior we ask of our child, it establishes a behavioral habit in the child. Once a habit forms, it takes on a life of its own. The habit starts to feel familiar, comfortable, and becomes part of who your child is. Like developing the habit of brushing teeth, or taking a shower. In this case, it is a habit of helping and of being responsible within the family. Your appreciation after they accomplish the task, becomes embedded in the good feeling that comes from the habit. It is not that different from the M&M reward you may have given your child for using the potty. Eventually they use the toilet even without the M&M. You want help with a project. You say to your child “I need help cleaning out the garage. I would like you to help me.’ Then you can work out a reasonable time when your child can help. Then allow them to grump, groan, complain, argue. But keep firm about your expectation, etc. You want help with a task. You say to your child, “The living room is messy, and we have guests coming. I want you to help me clean up’. Then allow them to grump, groan, complain, argue. But keep firm about your expectation, etc. I am not saying this is a miracle pill. Teaching lessons is hard work. It takes time and need to be taught over and over. I am saying is don’t get so bent out of shape yourself if conflict happens with your child around doing their chore of setting the table, or when you ask your child to help you put the groceries in the refrigerator. Just hang in there. Eventually the lesson is absorbed.